Congratulations to Andrew Ceroni, author of Snow Men, one of three finalists for the Outskirts Press 2014 Best Book of the Year Award. The three finalists are being introduced throughout the week on this blog. Public voting will determine which of the three finalists should be awarded the Outskirts Press 2014 Best Book of the Year Award and its $1,500 Grand Prize. Voting is open to everyone and begins on this blog on Thursday, September 3. Dave McClure is on a plane to Alaska in early winter, having quit his job with the FBI and turned his back on the world. It’s been a year since the horrific accident that claimed his wife and son, and McClure is still unable to move beyond his grief. Remembering the joy he once shared with his wife on vacation in Alaska, he heads north… seeking solace and resolving to either put his painful past behind him or succumb to the unforgiving Alaskan wilderness. Instead, McClure finds a grisly scene in the forest—the body of a hunter whose throat has been cut ear to ear. And that’s only the beginning. In Snow Men—equal parts international thriller and wilderness survival—McClure uncovers a cache of nuclear weapons and a Russian-Iranian plot to wipe the nation of Israel off the map. With only a hunting rifle, a pistol, and a few days worth of supplies, Dave McClure not only faces Russian Special Forces and the harsh reality of nature, but discovers a will to live he didn’t know he still had. Spanning locales in Alaska, Paris, Amsterdam, Tel Aviv, Jerusalem, Thailand, and Washington, DC, Snow Men is a stunning thriller set against the pristine beauty of Alaska’s rugged Wrangell-St. Elias wilderness. Every year, Outskirts Press recognizes the best book they publish with their annual Outskirts Press Best Book of the Year award, which must not only win an EVVY Award from the Colorado Independent Publishers Association but must also be recognized as the best book among three finalists. 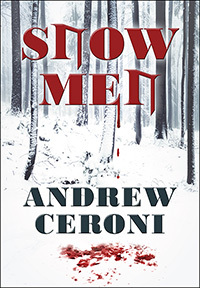 As one of three finalists, Andrew Ceroni and his book Snow Men will be competing head-to-head-to-head with the other two finalists in a public poll on this blog starting on Thursday. Andrew has already demonstrated he has the writing chops to win this prestigious award, as evidenced by his EVVY Award win. Does he have the marketing prowess to make it as the Best Book of the Year author in this digital age? Stay tuned for information on the remaining finalists being announced this week, and then come back on Thursday to vote for the book you believe to be the best among the three. The author of the winning book will receive a $1,500 credit to his or her Publishing Center, courtesy of Outskirts Press, and an exclusive 2014 Best Book of the Year award seal to apply to the cover of the book. Next Next post: Would Your Book Make a Great Movie?